Family history can be a tough thing to sort out. Dates and facts get mixed up and some details just get lost over time as they are passed down through generations. When you want to untangle these genealogical mysteries, you have to turn to documents and records such as those taken from a census or an obituary written after an ancestor has passed. Sometimes, even small details like what street a person lived on can fill gaps. For this information you can turn to city directories. City directories can also be used to get an approximate idea of when a building was constructed, how long a business existed, and who might have been the previous occupant in a residence. These directories can be found in the Local History Roomopens a new window or by making a request to staff at the 4th floor information desk. Nova Scotia Archivesopens a new window has made digital copies of several directoriesopens a new window available on their website. Although many can be seen online, some require you to visit in person to access the archives on microfilm. During World War II, my grandfather enlisted to serve in PEI and wound up in Halifax where he would eventually meet my grandmother. Family history is shaky, but I was able to find out that he may have only been in the city for about a year before a medical discharge saw him return to his home province. Using the Halifax and Dartmouth city directories, I discovered he lived in Halifax around 1943 at what was then 97 Creighton St. (now 2315 on the same street). Image taken from 1943 Halifax and Dartmouth City Directory. “Act ser” was short for “Active Service” since my grandfather was in the military at the time. Doing some further digging in the 1942 directory, I found out that David Croft was the previous tenant listed for that same address, along with his wife and a few of their children. David Croft is my great-grandfather on my grandmother’s side and he passed away in late January of 1943. It is very possible that my great-grandmother allowed my grandfather to rent a room after David’s passing in order to help with the family’s financial situation. This may have been how my grandfather and grandmother came to know one another. Image taken from 1942 Halifax and Dartmouth City Directory. In 1958, the city of Halifax changed how it assigned civic addresses, a process that would take until about 1965 to complete. This is why in the previous example there was a change in the numbering of the building my grandfather lived in around 1943. Previous to 1958, the process for assigning numbers to new buildings had been done with no real rhyme or reason. The new system was implemented to provide some geographical logic. The Halifax Municipal Archives website provides more information on how and why these changes occurred. They also provide a handy document that can help you convert the pre-1958 civic addresses to their present day locations. Genealogical research can be a very time-consuming, sometimes frustrating, but ultimately rewarding process. 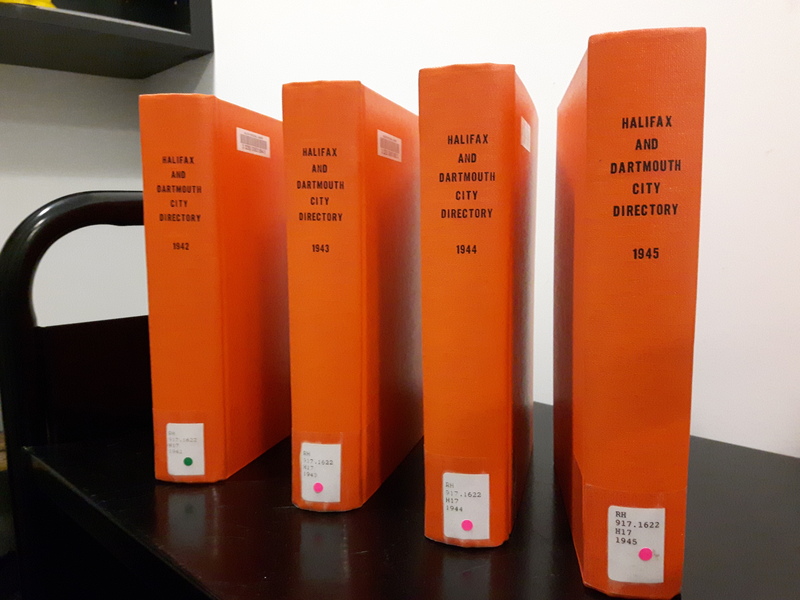 Directories are one of many different kinds of resources that you can find at your nearest Halifax Public Libraries branch which will help you add new leaves to your family tree.